Ce condo est situé juste en haut de la colline à Silverthorne, CO situé dans la zone appelée Wildernest. Il est à 30 minutes ou moins de Keystone, Copper, Loveland, Arapahoe Basin et Breckenridge Stations de ski. La vue depuis la grande terrasse est à couper le souffle. Il ya une navette gratuite sur le côté opposé de la rue de la copropriété qui vous emmènera en ville ou pour les stations de ski. Que vous soyez à la randonnée en été ou de la raquette en hiver, il ya beaucoup de sentiers de randonnée juste devant la porte d'entrée. Le condo est situé au premier étage, ce qui facilite le transport de votre équipement de ski / snowboard et de vos courses. Le condo est équipé avec un matelas à plateau-coussin queen dans la chambre, beaucoup de draps et de serviettes. Le canapé-lit queen est doté d'un matelas en mousse à mémoire de refroidissement. La cuisine est aménagée avec de nouveaux appareils, des comptoirs en granit et un évier en cuivre. Il est également équipé de tous les ustensiles de cuisine, de pâtisserie et de service dont vous aurez besoin. We had a perfect mini vacation with 4 days of skiing , Vail , Beaver Creek , Copper Mountain and Keystone . The condo was wonderful , no complaints at all , a little too expensive for March ,but I guess these are the prices for that month . We had a rental car and not used the shuttle , but it is very convenient located across the street . Good restaurants and grocery stores in town . Thank You Kathryn for everything ! This is a great property. The unit was very clean and well appointed. There was truly nothing missing. Kathryn is fantastic to work with. We truly enjoyed our stay. Thank you for the kind review and for taking such great care of the unit. We hope you stay again in the future. Enjoy the rest of the ski season! The unit is exactly as described. Beautifully remodeled. 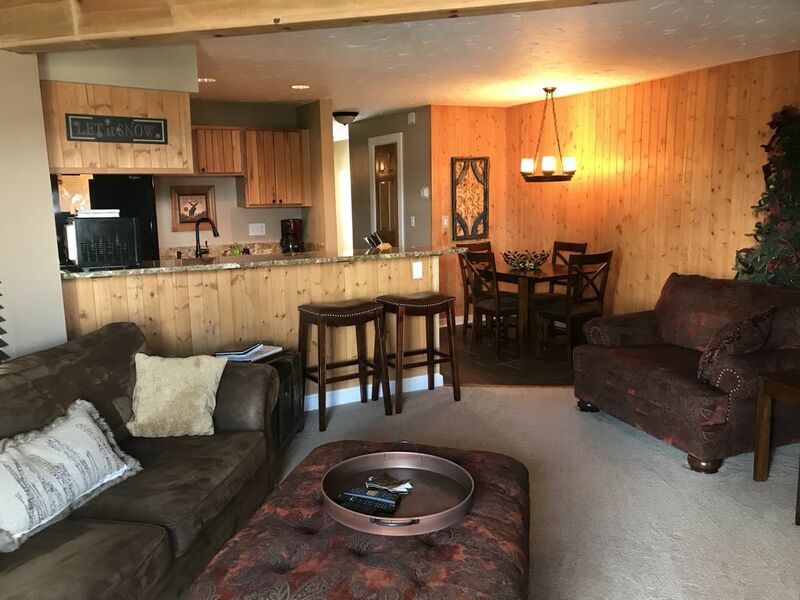 Everything looks brand new, the place was immaculate, and the location is ideal for any activities in Summit county or nearby. The bed is extremely comfortable. The owner, Kathryn was easy to reach and very quick to reply. She stocked the place with plenty of linens, some courtesy bottled water, condiments, foil, zip-locks, coffee, etc. Having an in unit washer and dryer was a huge bonus. I enjoyed my stay and will definitely be back. This place is perfect! Thanks again Kathryn! Thank you so much for the kind review and for taking such great care of the condo!! Hope to host you again soon. We really enjoyed our 1 week stay in this condo.This condo has a very well equipped kitchen, even with water & condiments in the fridge that you can use. Love the pots with strainer lids, so useful in cooking spaghetti! There's also washer & dryer in the room with detergent & softener which are really convenient. We drove a sedan and had no problem getting in/out the parking lot in winter conditions. It snowed few days while we were there and the roads were very well maintained. Kathryn is very nice to work with, she is very responsive & answered our questions promptly. Thank you so much for the kind review and for taking such great care of the condo. We are so glad you enjoyed your stay and we hope to see you again soon. This was our 3rd time to stay here... and we obviously love it or we would not keep coming back. The bed is super comfortable. We love the ability to cook some of our own meals. The back deck is a great place to curl up and read a book. I know we will be back. One of our favorite places and it is also a great price. Thank you for your kind words and for taking such great care of the condo. We are glad that you have continued to enjoy your stay. Very well taken care of condo. Enjoyed our stay! Thank you for the nice review and for taking such great care of the condo we really appreciate it. We hope to see you again soon! Please inquire about extended stay rates/monthly rates. Discounts will be given for stays longer than 4 nights (excluding peak times).